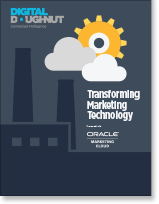 Digital Doughnut and Oracle Marketing Cloud partnered to produce a new framework that gives marketing leaders the tools and knowledge required to guide the successful deployment of marketing technology. • When is the right time to bring in new technology? • What is the correct technology and accompanying business case? • Who will oversee the introduction of the technology? • How are decisions going to be made? • Who will be impacted? Download your copy now to read the recommendations to achieving success.